There is a fundamental contradiction between reducing greenhouse gas emissions and perpetual population growth – that is, growth in the number of greenhouse gas emitters – driven almost entirely by mass immigration at this point in time. But don’t expect California’s movers and shakers ever to admit this publicly. Since the wicked Trump administration is on the opposite side of the fence – if not on another planet altogether – when it comes to these two contentious issues, Jerry Brown basks in the acclaim of the progressive left and his liberal electorate. Some California dreamers actually say they want the Golden State to secede from the United States, leaving behind forever the reactionary “America First” knuckle-draggers and troglodytes and forming a progressive new country open wide to the world and possessing its 8th-largest economy. Brown’s and his enablers’ boundless narcissism and arrogance are astounding. Let’s look at the intersection of the two issues above to reveal the extent of liberal feel-good folly. A recent article at the NPR affiliate KPCC 89.3 FM website asks: “Is California climate law worsening pollution in communities of color?” Reporter Emily Guerin writes that some Latino environmental activists in the Los Angeles region share the disdain of the California Chamber of Commerce for the cap-and-trade program that is at the heart of state efforts to slash carbon dioxide emissions almost in half by 2030. Community activist Magali Sanchez Hall is a resident of Wilmington, next to the port of Long Beach. 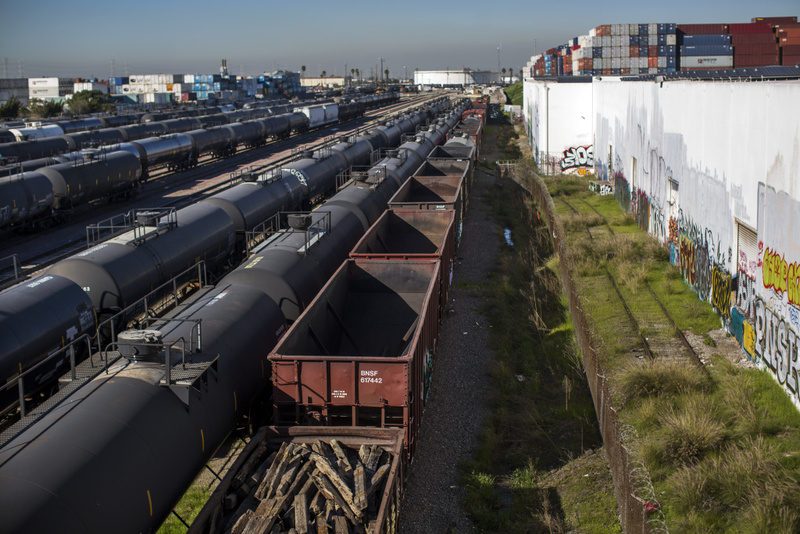 Wilmington is a low-income, largely Latino neighborhood nestled beside the Port of Los Angeles, the 110-freeway, railroad tracks and yards, and oil refineries. It is the epitome of the kind of community ripe for the activism of environmental justice advocates. next to the Port of Los Angeles. A dusty warehouse exports alfalfa from the ports. Nearby, smoke-spewing diesel trucks snort and rumble around a bustling storage yard with shipping containers stacked four high. Within view of Sanchez Hall’s street is the Tesoro oil refinery – a large emitter of not just greenhouse gasses but toxic organic compounds like benzene. When Sanchez Hall runs her finger on the hood of a car, it is blackened by soot. “It’s a combination of all these pollutions that are coming from everywhere,” she tells the KPCC reporter. In the first two years that California’s cap-and-trade program was implemented, industrial emissions actually increased in places like Wilmington, according to a 2016 study by the Program for Environmental and Regional Equity at the University of Southern California. It is uncertain if this increase was because of cap-and-trade or due to the fact that the state was emerging from an economic recession during the period of study. in the Long Beach and Los Angeles ports. One possible culprit may be the offset provision of cap-and-trade, which credits polluters for reducing carbon emissions somewhere else while continuing to emit CO2 inside California. For example, a refinery can pay to plant a carbon-sequestering tree in another state, but this does not reduce either CO2 or local pollutants emitted by the refinery in Southern California. And of course, accompanying CO2 emissions out of smokestacks are toxic chemicals and smog-forming compounds (VOCs, or volatile organic compounds). 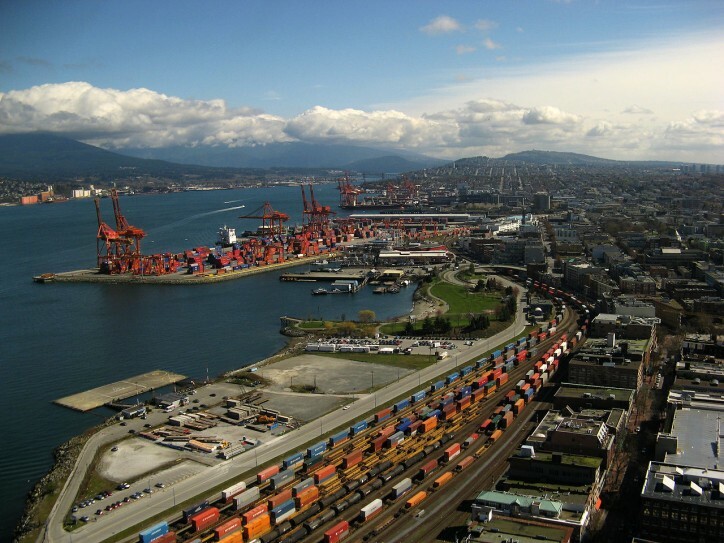 Bustling Port of Long Beach. Because cap-and-trade does not require industries to directly cut their pollution, but allows for offsets, the program may potentially result in even filthier air in already contaminated, low-income and minority neighborhoods like Wilmington. Defenders of cap-and-trade, including the California Air Resources Board (which implements it) and big environmental groups, believe the program just needs to be given more time. Still others say that the federal Clean Air Act should be used to address local smog and toxic air pollution, which is what it was designed to do. Local residents subjected to even higher levels of toxic pollution than before implementation of the state’s cap-and-trade climate program are just fed up and running out of patience. Their travails are widely shared around the world. 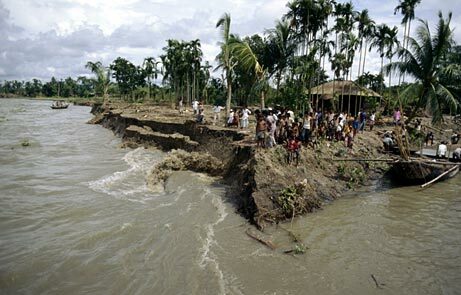 an unstable island of shifting silt on which poor Bangladeshis live. “For human societies, [climate] risks are not evenly distributed; in general, poorer countries are more vulnerable to the vagaries of climate change than richer ones, and within any given country, poorer people more at risk than richer people. “…the study found that emissions will start to rebound after 2030, largely because of population growth. California's population, now 38 million, is expected to top 50 million by 2050, pushing up the demand for electricity and fuel. Once upon a time, probably back in elementary school, or maybe in my mom’s kitchen, I learned that it was not possible to have your cake and eat it too. Those California dreamers, like our governor, who believe it is possible to have perpetual population growth at the same time as deep emissions cuts have yet to learn this elementary concept. They indulge in magical thinking, and my mom wouldn’t have allowed them anywhere near the kitchen to snitch that last slice of cake.